We have attended a couple cattle-related events these past couple of weeks. 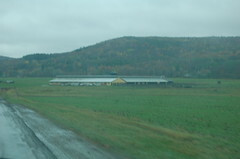 The first was a pasture walk at Lone Birch Farm in Homer. 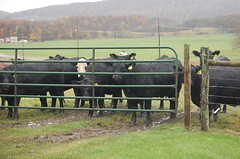 Besides a running booming horse boarding operation, they raise steers for freezer beef and restaurant trade. 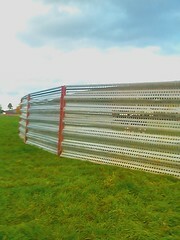 But what we all came to see were these windbreaks. Purchased and shipped from Nebraska, these panels are portable and easy to assemble. And really do block the wind! 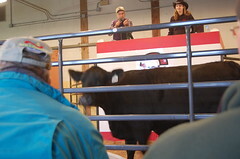 Yesterday we travelled to the Cornell Beef farm for their third annual beef heifer sale. 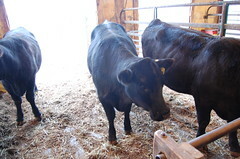 The stock was primarily angus, with several simmental angus cross heifers. Some angus were crossed with Gelbvieh and there was a lone hereford. I think bidding was off previous years’ prices. Heifers went from around $700 to $1700. For the most part, these cattle were raised by Cornell students with some consignments mixed in. 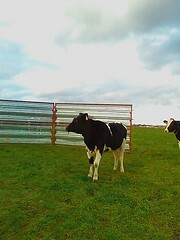 These cattle were not in the sale but just out in the field.